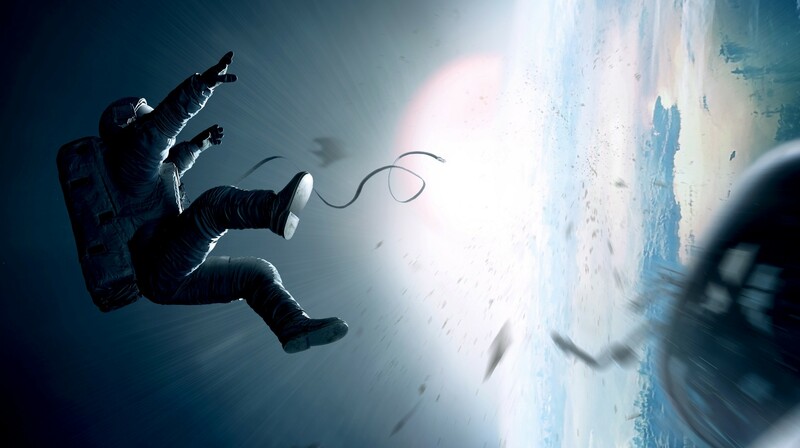 Out of all the movies I saw in 2013 (and there were quite a few) I’d have to say that Gravity was my favorite. I’m not sure exactly what it was about this film, whether it was the superb direction (Alfonso Cuarón, Children of Men), the exploration of humanity within space, or the mere fact that my wife and I saw the movie on our first weekend away from our twin daughters. (I’d lean towards the last, but I am sure it is a combination of all three.) 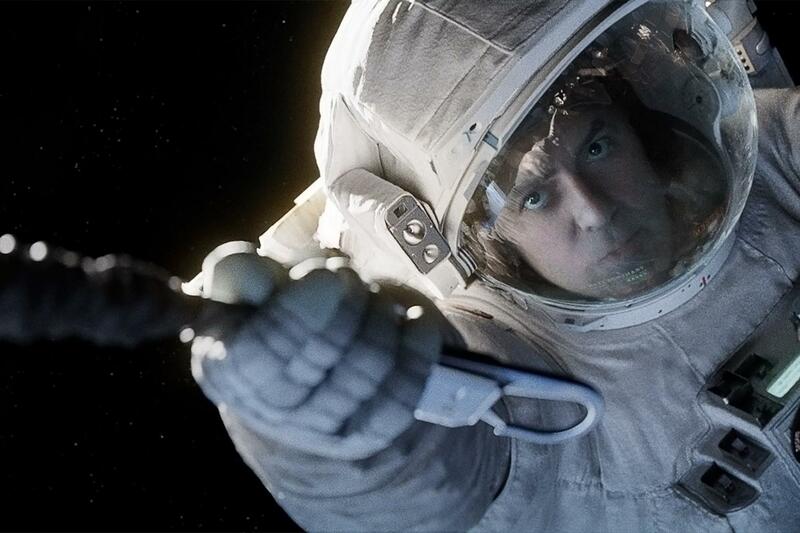 Nonetheless, Gravity is an exceptional film, that tightly narrates a survival story set in outer space. I say, “tightly” narrates because the running time is only 90 minutes, and I found such restraint by the director work for the advantage of the story (i.e. no unnecessary distractions with subplots or superfluous characters). The story is rather simple. Dr. Ryan Stone, a brilliant medical engineer, accompanies a mission commanded by veteran astronaut, Matt Kowalski (George Clooney), to do a routine service on the Hubble Space Telescope. While it is Stone’s first trip to outer space, it is Kowalski’s final mission before retirement. The mission is disrupted by debris from a Russian satellite attack, and Stone and Kowalski find themselves alone, struggling to survive in the silence of space. Survival movies have become quite popular over the years with the production of films such as Castaway, Life of Pi, and All is Lost. I have even heard a couple of my friends refer to this film as “Castaway in Space.” However, the key difference is that the setting of Gravity is in space, while the others are in the ocean, whether adrift at sea or stranded on an island. The difference might not seem that apparent, but often with Science Fiction the setting can become itself the primary character overshadowing the human players of the story. 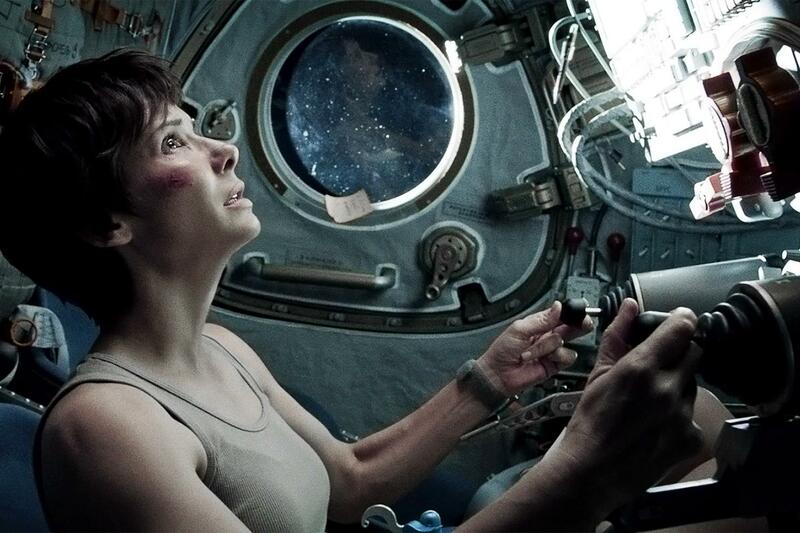 You can see the temptation here in Cuarón’s Gravity, where three years of production was spent on the film’s visual effects, comprising over 80 of 91 minutes of the film. (I was thankful to have seen it on the Big Screen. It did not disappoint.) That is a crazy amount of devotion to the aesthetics of the film. And yet Cuarón (who justly earned the Academy Award for Best Director) aptly presents a dazzlingly beautiful picture while still managing to tell a compelling story with a multidimensional character. Of course the talented Sandra Bullock effectively brings out the character’s multiple dimensions inviting us to experience with Dr. Stone, the weight of her situation, facing not only the danger of death, but also the meaning of life. In all, the film is an engaging thriller that presents its story of survival with award winning effects and cinematography. But if the observer is not careful they will only take in the beautiful grandeur of space and neglect the all more beautiful grandeur of the human soul. So what are the themes of Gravity? I believe that they are at least twofold (and probably many others that would fall under these two main ones). The first is the meaning of life. The idea is explored as the main character struggles to find the motivation to survive. She is even posed with the question by Kowalski, “What’s the point of living?” Dr. Stone even goes through some of the five stages of grief (Denial, Anger, Bargaining, Depression, and Acceptance) as she is faced with almost certain death. The backdrop of this struggle is an infinite space that makes humanity feel tiny and insignificant, begging the question of the meaning of humanity’s existence within the ever-expansive universe. One of the more interesting aspects of Dr. Stone’s character that illumines this tension even more is the fact that her daughter passed away. She is all alone with no mention of a husband or any other family. The most precious person in the world to her is gone. So the question is implied throughout, “Why even bother to fight or struggle anymore to survive in a universe that feels void, lonely, and silent?” Religious or political identity is found to be only shades or expressions of humanity, but not what gives it meaning (communicated through the not-so-subtle images of Dr. Stone traveling from the American shuttle to the Russian shuttle to the Chinese shuttle, as well as the Buddha statue in it) and the will to survive. The film seems to attribute the meaning of humanity, and ultimately to all of “life,” to survival itself, which is the second theme of the film. There is no question that survival is a prevailing theme throughout the film, much like that of Castaway and other films of this ilk. But for Gravity, it is the essential element that defines humanity and shapes one’s understanding of how humanity “fits” into the rest of the universe. It is probably best to start with the last scene, where Dr. Stone makes it to earth. The scene shows her falling from sky like a meteor and landing in the water, where she struggles to breath, but slowly moves her way to the shore. She lies flat on the beach as she gets her breath and slowly moves to all fours and gradually (ever so gradually) makes it to where she is erect, walking on two legs. This is a vivid picture of evolution: the origin of humanity starting from a meteor, forming from primordial slime, and then slowly but surely surviving (and thus “evolving”) each step of the process into what its present state of human. Working back from this presupposition, Cuarón provides some explicit scenes of what he calls “rebirth” that represents the survival spirit of humanity implicit in its evolution. The most vivid is when Dr. Stone makes it back to the capsule just in time before she runs out of oxygen. She takes off her astronaut gear and as the shot spans back, she is in the posture of a baby fetus, with the umbilical cord and all. Having survived that struggle (she has more throughout the rest of the film) she goes through a sort of “rebirth” and with each subsequent survival she is fulfilling not only what it means to be human, but also the manner in which humanity is able to fit into the universe that is ever evolving with only that which survives. And it is in this sense of survival (the cycle of death and rebirth, or survival and evolution) that humanity does not stand in stark contrast to the rest of the universe anymore. It is part of it, but merely at a heightened level. So where are the points of intersection with a Christian worldview? How does a Christian (at least this Christian) view such a movie? It might be best to interact with the themes presented in the movie: the meaning of life and survival (or humanity’s relationship with the universe). I find that this film portrays the contrast of such a complicated being as human (having personality, dreams, aspirations, the desire to live, to understand and accept death, to delight in beauty, to make jokes, to pray and give thanks) with outer space (being lifeless, silent, and vast emptiness). There is no doubt that the universe is beautiful, and Cuarón does an excellent job beautifully portraying it. But the very recognition of its beauty is part of what sets humanity apart. If anything, this film screams that humanity is something completely out of the ordinary within its setting. As Chesterton says, “We talk of wild animals; but man is the only wild animal. It is man that has broken out.” Humanity is unique, set apart, and in a greater sense, sacred. What is man that you are mindful of him? The creation story in Genesis 1 (on which Psalm 8 reflects) reveals that humanity’s uniqueness is grounded and sustained within the truth that both male and female were created in the image of God, in his very likeness (Genesis 1:26 – 27), and were given special roles of ruling and having dominion (1:28), naming the animals (2:19), and working and keeping the garden (Genesis 2:15). More than anything, what sets humanity apart is the ability to relate with God: to know and be known, to love and serve, to worship and obey. Though humanity is part of creation, it is above and beyond the rest of the universe as God’s pinnacle, the crown of his creation. Thus, the meaning of life is found in relation to God’s purposes in creation, and specifically for humanity to have a right relationship with him, to reflect his character and purposes, and ultimately to enjoy him and glorify him. However, because humanity has fallen through disobedience and sin, there is an infinite chasm between what humanity is and what God had intended it to be. Therefore, humanity needs to be redeemed, rescued, and ultimately restored. And it is here, where the motif of “rebirth” of the film comes in so beautifully (though incompletely as the director/writer understands it). Cuarón uses this theme to communicate the process of struggle and survival within the human story (both at a physical, evolutionary level and also a “spiritual,” metaphorical level). Gravity communicates that it is through death and rebirth that humanity struggles and survives. Humanity, however, needs more than that. It is not just mere survival; it is Life itself that we are after. And as the human par excellence, Jesus Christ came and died and rose again, conquering death and filling the chasm that separates the humanity from its Creator. Thus, it is through the power of resurrection that Christ provides the means for humanity to achieve the fullness of meaning. It is the power of resurrection, that humanity finds true life. Where Gravity ends with the human spirit conquering but anticipating eventual death, the Christian life begins with the human spirit yielding and attaining everlasting life. As Christ has set before humanity, “If anyone would come after me, let him deny himself and take up his cross and follow me. For whoever would save his life will lose it, but whoever loses his life for my sake and the gospel’s will save it” (Mark 8:34–35). We find meaning not in survival, but Life Himself, in that we were created by Christ and for Christ (Colossians 1:16), and it is our faith and participation in his death and resurrection, that we have eternal life in Him. Psalmist rightly begins and ends with the stanza, “O LORD, our Lord, how majestic is your name in all the earth!” And by this declaration we understand the beginning and end of creation: the glory of God. For it is by Him and for Him that we were created.